Wake up to your favorite tunes using this beautiful sheet metal alarm clock! If you need to get up for work, class, or simply to avoid wasting the day away, setting an alarm is the obvious solution. Sure, you could buy a clock or just use your phone, but if you build Dejan Nedelkovski’s Arduino-based device, you can be reminded of your awesome Maker skills every morning. 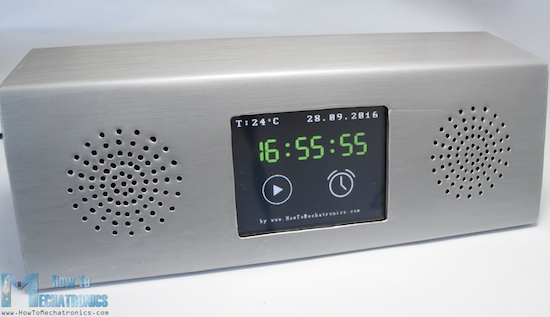 The clock is equipped with an Arduino Mega, an MP3, and an RTC module to play music and display the time and current song on a nice 3.2-inch touchscreen. The case, which was designed in SolidWorks, is made out of aluminum sheet metal. Considering that he used an improvised bender and hot glue to put it together, the results look fantastic! Want one of your own? Check out Nedelkovski’s “How to Mechatronics” website for code, schematics, and even a 3D model of the alarm itself.